…After the morning in Hekai, we come back to Menghai. 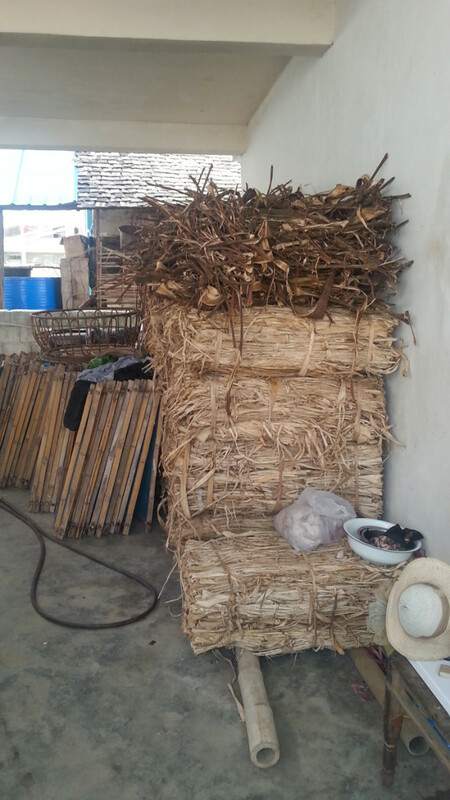 Next step, the production of paper to pack Puerh. 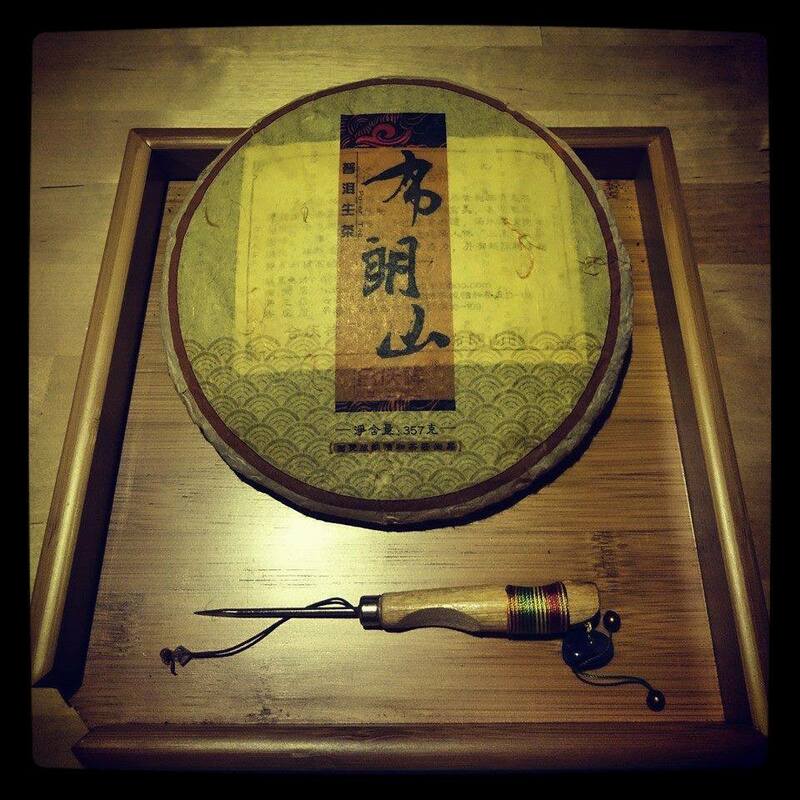 ...In my store, I heard calling with so many names: tile, cake, “flattened thing”, “that thing”… but today I don’t want to talk about the puerh tea, but rather of the paper used to pack cakes, the cake or Beeng Cha. One of the first regulations on the Yunnan tea dates back to 1734, when Yin Shan, governor of the Yunnan-Guizhou province, proposed some regulations to the Emperor YongZheng. The central government approved them and the following year was proclaimed the Yunnan ChaFa (Cha= tea Fa= law). So in addition to weight, shape, processing, these regulations also talked about packaging. 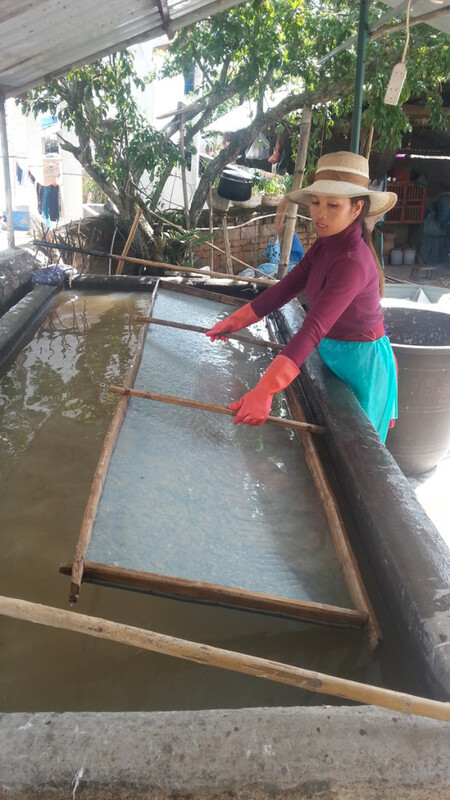 Since then, the preferred paper for the best teas, to store, transport and age it is precisely the mulberry paper. But first things first. A typical aspect of Chinese production, at least in the areas I visited, is the geographical division of the productions sectors: one city is famous for the production of furniture, a nearby town (maybe smaller) makes the knobs, another one will do the hinges. Obviously it’s just a quick example, but I think it is quite clear. It just rained, now the sun is very hot, soon it will start to rain again. These days it goes this way. 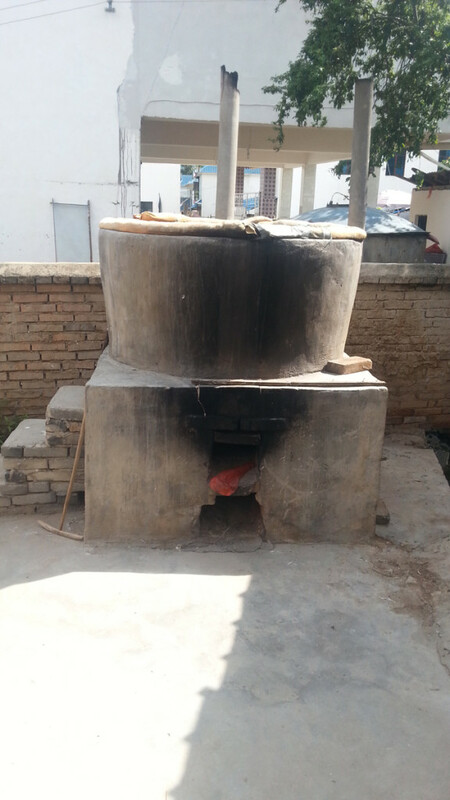 In the village of Manzhao lives DAI people. We arrive at lunchtime, and families are resting. But, like all southern peoples, the villagers turn out to be at once funny and not at all bothered … and soon the lesson begins. 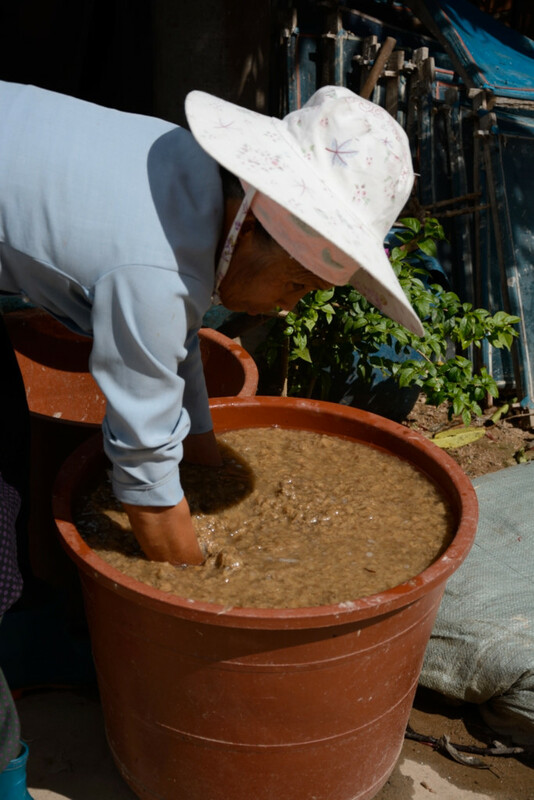 They use the mulberry plant that grows in southern Yunnan, but also in Laos and Vietnam. 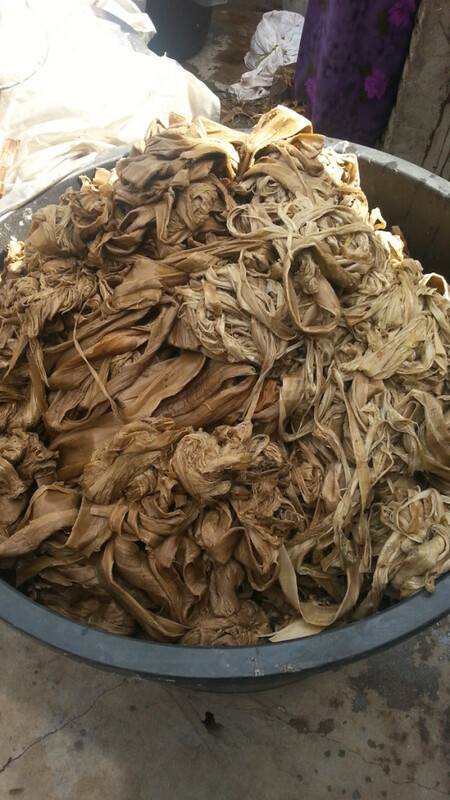 The part used is the bark that, after some processing, becomes paper. Let’s see how. The first step is precisely the bark. Note that the family that hosted us was having lunch. In the photo below, you can see the crockery . 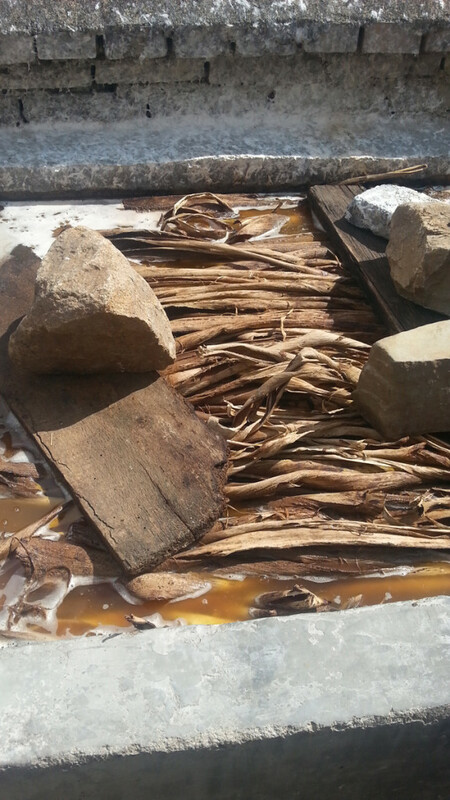 The bark is soaked (to soften it), for quite some time, at least a day, in special concrete tanks. We are quite far from the paper, right? Now the pulp will be put in water, in specific tanks, and then it will be “mixed” or rotated very quickly and violently. 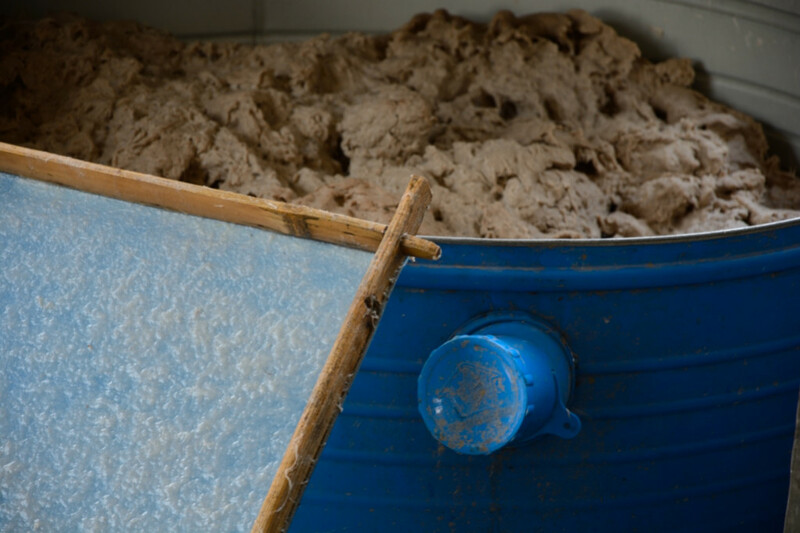 This operation, in addition to clean the bark, precipitating the impurities downwards, mix the cellulose. Subsequently, some frames (quite similar to silk-screen printing frames, I think) are immersed in tanks and pulled gently upwards. Then, the pulp is taken and spread evenly on the frames. … In this photo, before (the bark pulp) and after (the fibers on the frame). Clear, right? 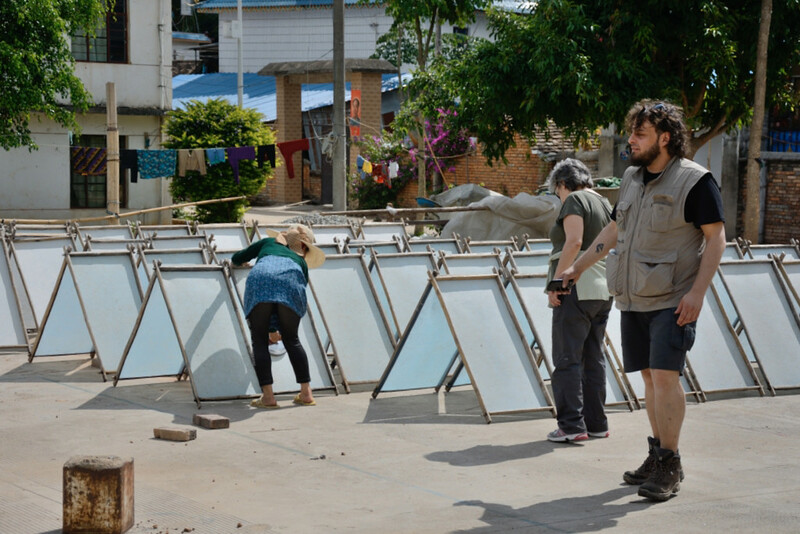 Subsequently, the frames are placed to dry in the sun. ..ok, the paper is ready. 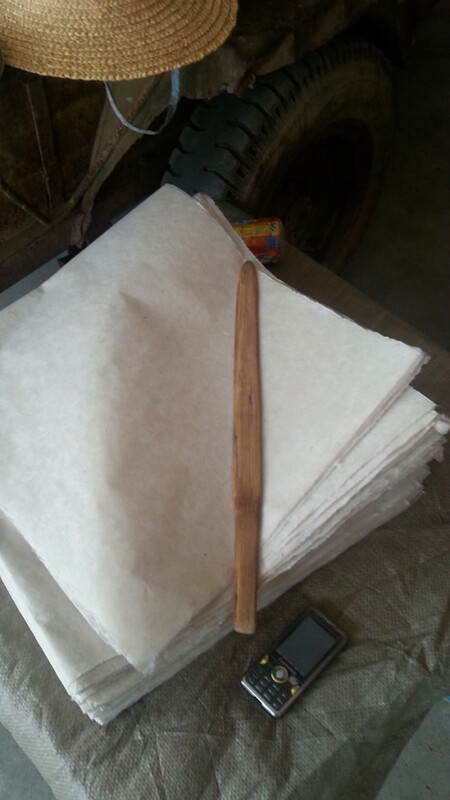 It’s obvious that the paper can also be used for other purposes, not only to pack the puerh. But now, let’s clarify a thing. It’s obvious that not all puerh is packed with this kind of paper, indeed. Let’s say that, at least from what I’ve seen, and at least as I understand it, and at least for the things I have discussed, only a small part of puerh is still packed with this paper. But we must also understand something else. Probably a Chinese who likes puerh would never buy a blend, that is a puerh made with leaves coming from more than one garden/forest/tree: he just buys the tea of that particular crop of that particular garden. In some areas of Southern Yunnan trees are numbered! It means that a buyer can buy the harvest of a particular tree, perhaps the 1606. And probably the magic is all there: in the hands that collect, produce, and make the tea. As a result, only a few batches, the most important and perhaps the most valuable ones, are still packed with this kind of paper. So, identifying the paper can be a good starting point to evaluate a puerh. It’s all for today, I hope you enjoyed it. And I promise you that with the next article I’ll begin to write puerh in the right way, pu’er.